A glamorous independent American woman, played by beautiful US actress Jessica Biel, falls in love with a dashing English soldier and enters into a spirited battle of wits with Kristin Scott Thomas (The English Patient) her disapproving new mother-in-law. This 1920s period romantic comedy also stars Colin Firth (Mamma Mia! ), and is based on the play by Noel Coward. Easy Virtue fizzes with droll humour, pithy observations on the class system and some brilliantly acidic one-liners. It’s wall-to-wall wit on a grand scale. Easy Virtue. A rich blend of the biggest British names. The result is a hilarious and spicy drama that incorporates class warfare, cultural warfare and the one-upmanship associated with the British stereotype of mother-in-laws who meddle. Adapting Noel Coward for modern times. Easy Virtue has all the elements of a British period drama, but it pulls the carpet out from under your feet, with an injection of a large dose of irreverence, unusual special effects and a killer soundtrack made by BAFTA-winning composer Marius de Vries (Moulin Rouge, William Shakespeare’s Romeo + Juliet). Seeing British Culture from the outside-in. The arrival of the American girl Larita (Jessica Biel), as the new wife of John Whittaker (Ben Barnes) gives the film’s audience a refreshing and critical way of looking at post-Victorian British society with new eyes. The best of British acting. Creating a quintessentially British family that live in a stately home, complete with a butler (Kris Marshall), Easy Virtue takes the cream of the crop in British actors and throws them all into one rich mix. If you ask anyone in Britain to name some of the biggest British films in the past 10 or so years, they might mention Bridget Jones’ Diary, Four Weddings and Funeral, Love Actually, The English Patient and perhaps Gosford Park. 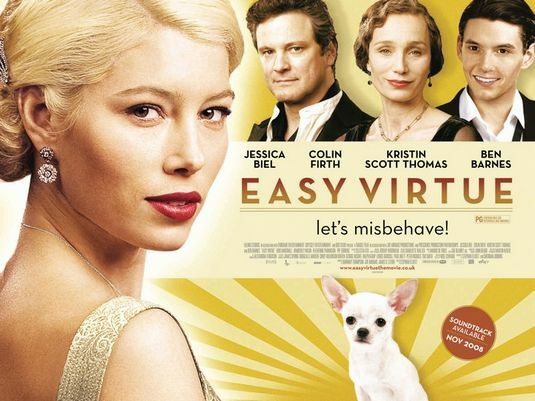 Easy Virtue is a pithy blend of acting from big names from these like Colin Firth (Bridget Jones’ Diary, Love Actually, The Girl with the Pearl Earring) as the head of the household; Kristin Scott Thomas (The Other Boleyn Girl, The English Patient, Gosford Park, Four Weddings and a Funeral) as the stoic but neurotic mother-in-law, and Ben Barnes (Stardust, The Chronicles of Narnia: Prince Caspian) as the American arrival’s new husband. I saw this movie today and it was mind-blowing. I don’t really like Jessica Biel as an actress and I am not sure what Mr. Stephen Elliot did to her, but he managed to get the absolute best out of her. Or maybe she was inspired by class acts – Kristin Scott Thomas and Colin Firth. Kris Marshall is an absolute delight to watch. Thank you M. Elliot – you make me want to read Noel Coward’s play. I love the layers you slowly unraveled in each character. I was always left wondering what Larita is going to do next. Was hugely happy to see the end. This would be Biel’s best character to date in my mind. Thank you Mr. Elliot – you make me want to read Noel Coward’s play. I love the layers you slowly unraveled in each character. I was always left wondering what Larita is going to do next. Was hugely happy to see the end. This would be Biel’s best character to date in my mind.